bentocar, originally uploaded by mkeih. Does anyone know what the make/model of this car is? I think its a Thunderbird, but can’t be certain. This entry was posted in Uncategorized and tagged bento, black, car, classic, classy, portland, vintage. Bookmark the permalink. HI mark, i just got your blog from your mom. i thought it was pretty neat. 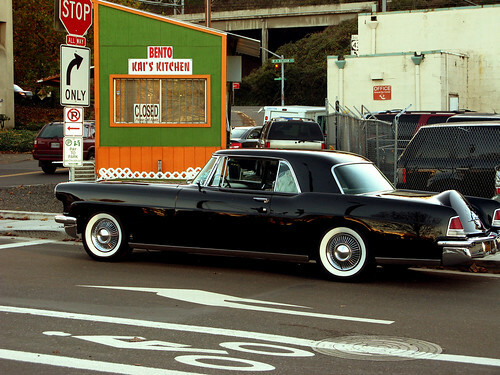 the above car is a lincoln continental mark something or other, like maybe I, II, or III – . as you may or may not know, i have a 57 t bird sitting in the garage, just rotting away from lack of use or care. poor thing. take care, i’ll check your blog from time to time.